Can I get a gold star? My six-year-old asked for a chore chart. You remember this child and her strange ways. She also asks for steamed broccoli for breakfast. I am not a fan of charts. I’m not philosophically opposed to them or anything. It is simply that we have very little routine or similarities to our days. I fly by the seat of my pants most of the time. To be perfectly honest, anytime I try to implement a schedule, it lasts two days. I stalled Norah for a few weeks as I tried to decide what to do about this chore business. I don’t want to frustrate her no-nonsense, black/white tendencies with my flights o’ fancy. I also didn’t want it to feel like a reward chart. As an adult who craves praise and gold stars, I am keen for my daughters to avoid this behavior. 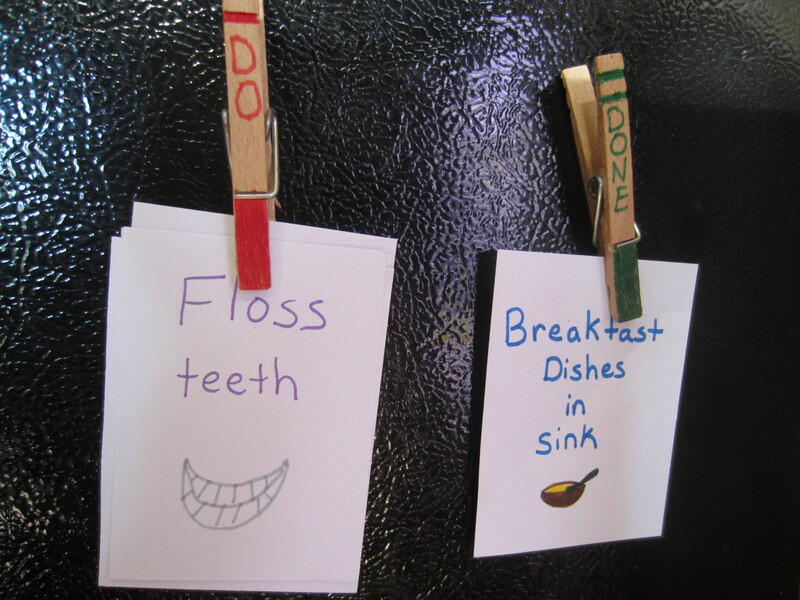 I can pick the day’s tasks each morning and clip them to the “do” clothespin. This way I can customize them to fit the day. I recognize that I’m prone to disorganization so I placed blank cards and markers nearby in case I need to create a new task. So far it is working for both of us. Norah enjoys looking at her tasks for the day. And I enjoy letting the cards nag instead of me. I felt much better when I had finished the task. But the doughnuts would have been nice. Posted in Family, Parenting and tagged chore charts, reward charts, six year old chores. Bookmark the permalink. I love those clothes pin messages. I wanted the charts and lists – they resisted. I read parenting tomes by the dozens – one day my smart alec ten-year-old son forbade me to read anymore. “Come back home, you young adults, I want to clothes pin your duties to the fridge.” Maybe I need to clothes pin mine to the fridge. Great idea using clothes pins to “pin” chores. Great visual display. Plan on trying this with my kids! It was a hard day that made me cry. The to-do list was my way of coping with the day. Thankfully, those days are coming less than they used to. Or maybe I’m getting better at recognizing when we need to evacuate the house and seek better climes.